Only the passing of decades and the identification with Il Duce have ensured this team isn’t as celebrated as it should be outside Italy. But then Vittorio Pozzo’s side accumulated records that Benito Mussolini couldn’t but trumpet: most of all, they became the first of just two teams to retain the World Cup. In between they also won Olympic gold while losing only three games over five years. As such, it was inevitable that the Fascists would fixate on such success to promote their supposed superiority. But Italian football was already on the up before the Black Shirts came to power. And, in truth, the only deeper link between the state and the team was in the style of management. Although a liberal-monarchist himself, Pozzo presided over the side like a dictator. Adopting a “semi-militaristic approach to the game”, as the book Calcio puts it, Pozzo claimed he “never lost sight of my players, not even for a minute”. The result was a team that was super-fit and physical… but not without a large degree of fantasy. Because Pozzo also enjoyed one of the most gifted ever Italian generations. With the squad founded on a Juventus core that had won five successive scudetto, it was finished off by two of the greatest forwards in Italian history. Giuseppe Meazza and Silvio Piola are two of only three Italians to have scored more than 200 goals in Serie A. But, other than their outstanding ability, that was about all they had in common. Meazza was Italian football’s first true superstar, Piola an antidivo who didn’t drink and shunned fine. For the national team, however, they complemented each other perfectly. Many said that about the conditions and the squad as a whole as they won that first World Cup in their own country. But they banished all doubts by doing it again in France four years later. As David Trezeguet thundered the ball into the Italian net to win Euro 2000, Dider Deschamps later admitted to stopping in the centre circle and thinking “it’s never going to get any better than this”. Certainly, very few will ever surpass it. France’s run of winning the World Cup, the continental championship and the Confederations Cup in quick succession remains unmatched in Europe. Along the way, they also only lost two competitive games while layering sheer quality onto cast-iron resolve. It was the latter they most needed to start the cycle though. It’s astonishing now to think how disregarded the French team were ahead of the 1998 World Cup. But Aime Jacquet rallied the team to eventually drive to the trophy with the meanest defence the World Cup has ever seen. As often happens with such besieged sides, that maiden conquest gave them the confidence to take things to the next level. But France didn’t just jump up. They made a quantum leap. Euro 2000 has since gone down as one of the great tournaments given the exquisite attacking football on show. And no-one defined that more than its champions. With the team centred around Zinedine Zidane in a 4-5-1 formation before it became fashionable, France produced all manner of magnificent angles. Indeed, in a rare instance of arrogance the week before the final, Zidane even admitted that “at 28, I’m at the pinnacle of my art”. Typically, it was when that unravelled in the build-up to 2002 that France did too. For a time though, it was difficult to see how Deschamps could possibly be wrong. Perfection required a path to be laid. And the Brazil side of 1958 broke the mould in more ways than one. Aside from winning that long-desired first World Cup, the 4-2-4 formation they pioneered blew away football and almost everyone that came up against it. Many opposition sides found that the same applied to the team as a whole. All that really keeps them behind Spain and their own successors in 1970 are the two draws that punctured otherwise perfect World Cups as well as the fact they couldn’t claim a South American championship. As such, they may not have been perfect. But they were certainly on the way there. In some eyes, the small margins of Spain’s four successive 1-0 wins on the way to the 2010 World Cup took the gloss off their glory. But that’s probably looking at things from the wrong perspective. Because it shouldn’t be forgotten that they euphorically waltzed their way to the European Championships with some wondrous football two years prior. Indeed, the exact quality of the football caught many teams by surprise. Built on a core of players from Barcelona’s youth system, Spain had a club-style cohesion that no modern international side could hope to match. Just like Barca, they controlled the ball with their passing and then controlled the space with their pressing. Indeed, no international team has ever utterly dominated individual matches in the manner Spain did. And, given that they did that in every game they played, it is no surprise that it was reflected on a grander scale. Between 2007 and the end of the World Cup, Spain produced the most relentless sequence in international history: they won an emphatic 49 games out of 54 (91%) while only losing twice. But it all meant that, by the start of the South African World Cup, most teams knew it was suicide to go toe to toe with Spain. As such, they echoed Jose Mourinho at Inter and blocked up as much space around their own goal as possible. The effect ensured a tournament performance that was in stark contrast to the abandon of the Euros. Spain passed and passed and passed until some people passed out… but, ultimately, they found away. The only blip, and a bare one at that, was the reversal to the USA in the Confederations Cup semi-finals. It is that smallest of margins, by contrast, that keeps them off the top. But possibly only temporarily. Because they still have the core squad, the consistency and the quality to make it a unique treble in Euro 2012. What they missed was perfection. Seven wins from seven and the most irresistible attack the World Cup has ever seen in both stats and style. 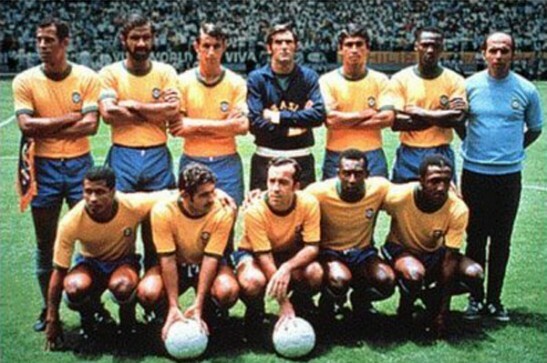 Brilliant individuals produced individual moments of brilliance that will forever remain burned on football’s collective memory: Carlos Alberto’s ball for Jairzinho against England, Rivelino’s free-kick, Tostao’s technique… But crescendo fittingly came in Carlos Alberto’s eight-man team goal. Or, as so many have said in the time since, “the highest expression of football as art”. If, unlike Pele’s pass for the goal, it seems obvious to have this team at the top, well then consider that the only complaint you could possibly have (other than necessarily lax defending) is that they never repeated it at another major tournament. But they didn’t get the chance. With no Copa America in between, the core of the side had gone by the 1974 World Cup and, in any case, had remained unbeaten for three years after 1970. At their best, as in this list, no-one could top them.